Girls football has arrived at Macleod JFC! 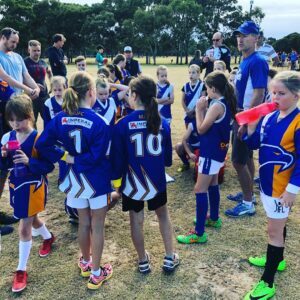 After 50 years in the making, Macleod JFC is pleased to announce we will be field all-girls teams for the first time through the 2018 season! Our under 10s have already played their first practise match, with coach Mark Medley at the helm. This was a great experience for all involved, with many of the girls playing football for the very first time. The numbers at training and the game have been growing each week, and we welcome all girls to come and be a part of MJFC history as we enter our first season. Coach Greg Griffiths has also been working hard to bring together the under 14 girls side. We still need a few numbers to strengthen the side, so would encourage any girls thinking about playing in the under 14 team to get in touch. Feel free to contact Paul Starmans (email: president@macleodjfc.com.au, phone: 0416 113 807) for more details on either team, or head straight to our registration page to signup.